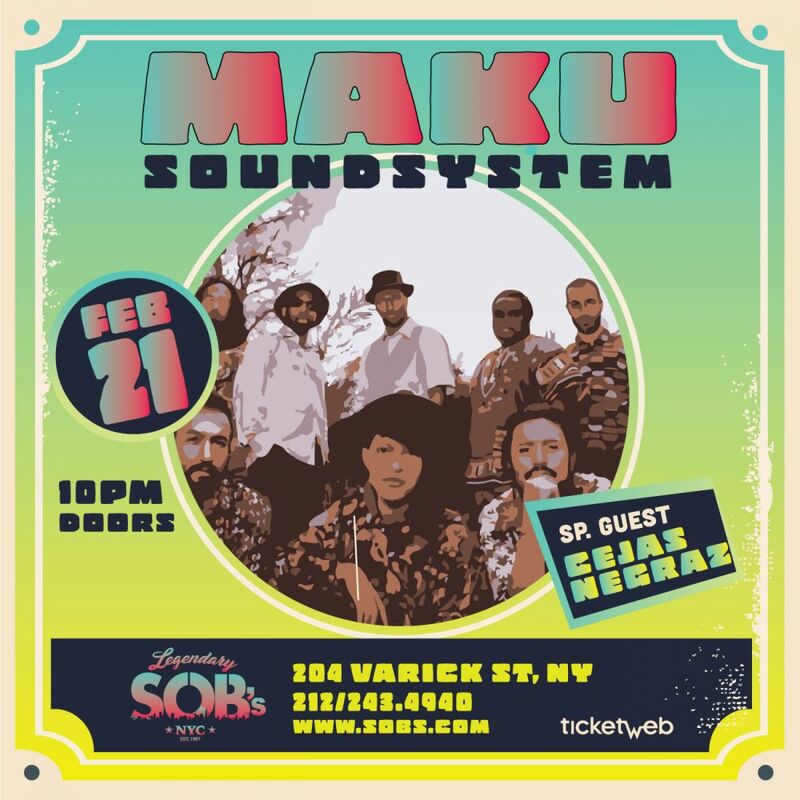 MAKU Soundsystem is an immigrant band from New York City. With most of its members hailing from Colombia, MAKU embodies an active quest for identity through sound and bodies in motion, and puts on a party for everyday people. Born in 2010 the band has independently released two full-length albums, two EPs, a highly-acclaimed album on Glitterbeat and toured across the U.S., Europe and Cabo Verde with their fiery grooves. MAKU Soundsystem’s fifth release 5 Fuegos (Peace & Rhythm, 2018) finds the Queens-Brooklyn-based, self-proclaimed “immigrant beat” band with a fresh new stripped down sound of five players: bass, guitar, drums, percussion, and vocals. Appropriately, the emphasis is on the beat, and while the brass section and keyboards are now gone, the principle vocalists Liliana Conde (who plays electronic percussion as well) and bassist Juan Ospina are still leading the charge with their stirringly emotional voices out front. Also as before, the heartfelt lyrics inspire you to feel with your heart while you dance to the polyrhythms with your feet.